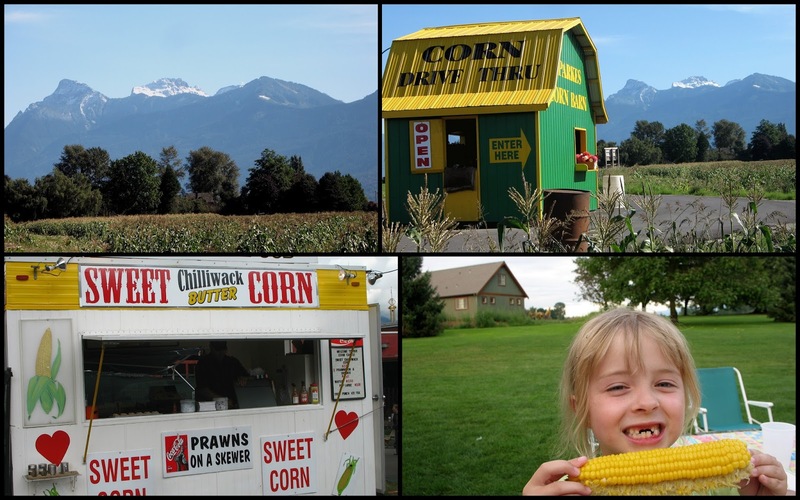 famous for sweet smelling country air and Chilliwack corn! From early July until sometime in fall we enjoy the best sweet corn around. usually on the grill or the stovetop. Today I will give you another method for cooking corn-on-the-cob. here is an easy way to prepare your corn. Carefully pour boiling water over the corn (to cover) and close the lid immediately. Allow to sit for at least thirty minutes...with no peeking. Serve with butter and seasonings. The corn will keep its temperature for several hours as long as the lid remains closed. Do not drain. Perfect and simple! I've heard of this method and always wondered if it really works?? This is brilliant! I hope you are all buying 'VanSantan Corn' It has not been genetically modified...Yea! And yes we experienced this corn prepared like this. It's the best. I think even I could manage this. Only U.S. corn here now. You valley girls had better do some marketing out this way. Do we drain the corn after the 30 mins? No...don't drain the corn. It can stay in the hot water for hours. I have never heard of this, but what a useful thing to know - thanks! The older I get, the more I appreciate "recipes" like this. I am so often caught up in finding just the right recipe or menu. I just love these basic ideas, they are brilliant and leave us time to do so many other valuable things! I am also wondering if you drain the water after 30 minutes. I was at the party and I saw them take the corn right out of the cooler with the water inside. I do not recall them draining it. I think that the idea is to keep the corn hot. tThis is brilliant! I doubt you could overcook the corn using this method. I've heard that once you use a cooler for hot you can't use it for cold again. Is that true? It doesn't seem like it would matter but I'd hate to find out the hard way. In my experience, the cooler still seemed to function as it should for keeping things cold. I did this and it worked fabulous! Even after the evening was over and everyone went home, there were a few cobs left in the cooler and just has hot has the first ones! Thanks for coming back and giving a review after trying the recipe. Glad it worked out for you! Anonymous...so sorry to hear your corn did not turn out as hoped. We have not heard of any similar complaints. In fact, everyone raves about the corn cooked this way. I am wondering how you avoid peeking when you have to boil enough water to cover the cobs of corn? I'm thinking I would have to boil water in stages/several pots and it would mean opening the lid of the cooler. Please advise and pardon my ignorance. I have the boiled water ready to add 'all at once' so that the lid doesn't have to be opened. I'm sure the corn would be fine if you open the lid once or twice, but a little heat escapes each time. Enjoy!